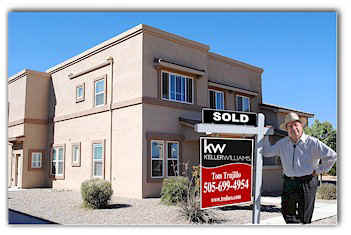 Tom sold our Santa Fe condo when no properties were selling in our condo association. He overcame the headwinds of the economy, the bad credit of would-be buyers, and a suit by the association against the builder. Despite the fact that our condo was probably listed at a lower price than properties Tom usually represented, he was always accessible and returned our calls or met with us promptly. He was always courteous and pleasant to deal with, and always told us the truth. He knows everyone in real estate in Santa Fe, has seen every possible situation, and knows how to make the sale happen for his seller. Tom was recommended to us by a former client of his, and he delivered for us just as he had done for her. I strongly recommend Tom Trujillo to anyone selling real estate in Santa Fe. I would use him again if I had another Santa Fe property to sell. Thanks Tom! You’re the best agent we ever worked with. You are a pleasure to work with, and we came to see you as a trusted friend as well as our agent.